Telepresence robots tend to be underwhelming. They’re expensive, for one, and not exceptionally user-friendly. And most aren’t intelligent, by any stretch of the imagination. At IFA 2018 in Berlin, Roboteam — the Tel Aviv-based startup behind Temi — formally introduced its home robot to the world. The 3-foot-tall, 4-wheeled bot sports a 10.1-inch QHD (2560 x1600) IPS LCD touchscreen connected to a motorized bracket; a hexa-core ARM processor that powers a skinned Android-based operating system; Wi-Fi, Bluetooth, and cellular connectivity; a battery that lasts eight hours on a charge; and myriad sensors, including a 360-degree lidar array, four omnidirectional microphones, two infrared depth cameras, two RGB cameras (one 13MP sensor and one 5MP wide-angle sensor), five proximity sensors, six time-of-flight linear sensors, and an inertial measurement unit. To that end, Temi’s controlled in one of two ways: with a smartphone app or through voice recognition. The former lets folks dialing in speak through Temi’s color display and 20-watt Harman Kardon speakers, an experience that’s not unlike FaceTime on iOS. The latter — powered by a homegrown assistant that currently supports English and Chinese — lets users within the robot’s earshot instruct it to play music, pull up a YouTube video, search for restaurants, or get a weather forecast for the week ahead. Temi’s real intelligence comes from its sensor fusion, Wolf said. Leveraging the aforementioned depth sensors, proximity sensors, and lidar, it explores its surroundings and forms a 2D map in time coming to “remember” particular locations. During video conferences, its cameras lock onto faces and adjust the screen’s tilt as needed. The system’s even robust enough to follow a person through a room (it tracks their legs) and carefully avoid obstacles, such as furniture, pets, and forgotten piles of laundry. Temi is something of a pivot for Roboteam, which for eight years developed all-terrain robotic systems for military deployments that perform reconnaissance, disarm explosives, and traverse unforgiving terrain. It’s a lucrative business — Temi’s defense contracts have generated over $ 100 million in revenue. But the way cofounder and CEO Yossi Wolf tells it, a consumer robot was always the endgame. Work kicked off three years ago with a $ 50 million investment from FengHe Investment Group (along with Alibaba chief technology officer John Wu) and a 65-person team of engineers, 15 of whom oversaw the assembly of early prototypes in China. Temi wasn’t always floor-bound. It started as a wearable system for the elderly, but the team quickly realized that it might cause users to trip and fall. “Sixty percent of elderly people fall while they’re carrying objects,” Wolf said. Temi will start at $ 1,500 — less than a typical MacBook, Wolf pointed out — when it goes on sale later this year. Roboteam plans to ramp production up to as many as 30,000 units a month by December, when preorders are expected to begin shipping. But those challenges haven’t discouraged investors, who in 2015 and 2016 committed close to $ 900 million to industrial and personal robotics startups, according to CrunchBase. That’s up from $ 450 million in 2014. Of course, voice assistants have been available in mobile phones for years — Apple’s Siri came out in 2011. But they have had limited impact on corporate environments so far. The number of voice-enabled devices continues to skyrocket — over 50 million of them are expected to be sold this year and the global voice tech industry is expected to reach US$ 126.5 billion by 2023. In addition, it’s likely that enterprise systems will start talking to each other. It’s very difficult to implement universal standards in computing, and using voice — although obviously inefficient — could be a very pragmatic short-term solution for system integration. We’re already seeing this in the consumer world, with the recent news that Amazon’s Alexa can now “talk to” Microsoft’s Cortana and vice-versa. Voice is also becoming part of innovative service approaches. For example, Workheld provides innovative field management systems to increase the productivity of construction- and service processes. The company uses machine learning and text analytics technology to automatically match customer jobs with the most appropriate technician, with hands-free voice interfaces to help workers through maintenance steps. There are still some problems with voice interfaces — for example, it can be hard (or just embarrassing) to use in a busy office where there’s a lot of background noise. As ever, technology companies are working on solutions: for example, more advanced noise cancellation using AI, picking out your voice in a crowd, reading your lips, or even detecting your words directly through your jaw, without you having to say them out loud (so maybe the future is actually about voiceless voice interfaces?!). And how will corporate security be enforced with voice interfaces when algorithms can create uncannily accurate synthesized speech? There are already problems with corporate “vishing” today — what will happen when the distinctive (but faked) voice of your CEO connects to the system to request an exceptional wire transfer? (Or when your teenage daughter calls you to say she’s in trouble and needs money?!). And then we can all look forward to the next big interface wave in the enterprise: artificial and augmented reality. This article originally appeared in Digital Business & Business Analytics. One of the most interesting developments from last month’s Google I/O event was the Google Duplex demo, where Google Assistant actually made a call on behalf of a human to make a beauty appointment… meaning Google Assistant called a human and had a conversation that led to an appointment being booked. Now that’s a cool trick (some folks might not characterize it as such, but that’s another story). It’s not available right this minute, so it kind of has a feel of being a gimmick or party trick that grabs your attention for a while before we move on to the next thing. And that party trick theme came up last week when the subject of voice assistants came up at Pegaworld in Las Vegas — the party trick capitol of the world. The CRM playaz — aka Paul Greenberg and yours truly — caught up with Pega VP of CRM Product Marketing Jeff Nicholson for an impromptu conversation at the conference. We covered a lot of ground in the time we had with Jeff, including some bragging about the Patriots winning five Super Bowls, which was countered by the Yankees’ 27 World Series championships, which left me and my Rams’ one Super Bowl win pretty speechless during this time. But when I asked Jeff about voice assistants and their role in business, things got pretty interesting, as he feels that we’re currently in the era of party tricks; and that we need to get into an era of practical applications within the next year or two — or it might only be a flash in the pan. Finally, Jeff feels the only thing really holding it back are people coming up with serious use cases. Now, there’s a lot to agree with in Jeff’s observations about voice. And many vendor executives I’ve talked to over the past 12 to 18 months or so agree with him. It’s easy to see why, as the things like ordering a pizza or starting your car brings a lot of attention and hype to Alexa and Google Assistant. But a deeper look beneath the surface reveals the move from party tricks to practical applications is already taking place; and the charge is being led by folks who were drawn in by the party tricks but are now taking the inspiration born from those experiences into their workplace after the party is over. When Pega’s Nicholson said voice-first needed to go from parlor trick to practical purpose for things to take off in the industry, he perfectly described the path Alexa took in reaching the city of Albuquerque’s call center. As told via a piece by my buddy Don Fluckinger, it was the city’s digital engagement specialist Matt Maez’s ability to easily reorder his favorite Domino’s pizza that led to the creation of an Alexa skill that addresses residents’ 150 FAQs. The skill was rolled out last month as a soft launch and a a bigger push is expected to take place later this year, with a goal of reducing call volume by 15 percent in two years. But there are concerns about scaling issues as Alexa interactions increase over time. However, in the long run, based on AWS’ track record, it’s expected to be less of a concern. And I suspect that using voice assistants will become a viable way to scale self-service capabilities that will become generally attractive as time goes on. One of Touchtown’s customers, North Florida Retirement Village, recently beta-tested the Alexa integration with a few residents and found it made immediate impact with scheduled reminders for taking medication. Using voice commands also makes it easy for seniors with declining motor skills. In fact, because of the initial positive response from the beta, North Florida is in the process of constructing smart apartments for future residents that will allow seniors to control lights, fans, televisions, and other devices with their voices. Alexa and Google Assistant aren’t the only game in town (and no I’m not talking about Siri). While they can do many things on your behalf, they can’t get into your Bank of America accounts for the time being… but Erica can. Erica is a financial AI assistant designed for BofA customers use their smartphone to manage their personal bank accounts. After activating Erica by tapping on the app, a user can ask her, for example, to lock their debit card after losing it or having it stolen, transfer funds between accounts, and look up past transactions. You can also schedule meetings with specialists at a branch, schedule payments, and even send money to people via Zelle. You can also ask for your past five purchases from Amazon. According to Bank of America CEO Brian Moynihan last month, 450,000 people were using Erica, and the BofA app had logged more than one million interactions. While the things she can do are relatively easy to start with, over time Erica will learn what’s important to customers and will perform more complex tasks to improve the customer experience. Focused on simplifying the laborious process of medical notetaking, Suki is an AI-powered, voice-enabled digital assistant for doctors, allowing them to spend more time treating patients than filling out forms. Having recently announced raising $ 20 million in funding (with Salesforce’s Marc Benioff being among the lead investors), the company is comprised of engineers, technologists, and clinicians from a who’s who of companies, including Apple, 23andMe, Google, Salesforce, and Oracle. These examples represent a rapidly growing number of projects that illustrate the “party tricks to practical applications” transition that is taking place. And Jeff Nicholson’s suggestion that the transition needs to be led by practitioners out there in the trenches is exactly what’s happening — in important areas like health, banking, senior living, and government services. All this adds up to an era of voice eventually crossing the chasm into the mainstream of even the most important areas of life. We’re still early days as most of what’s going on currently are beta projects. And important areas of concern like privacy and security, both from a consumer and enterprise perspectives, need to be entirely flushed out and thoroughly tested. But we’re moving in that direction, and I can’t wait to have my voice assistant call my barber to set up my next cut. Setting up surveys with Voice of the Customer allows users to quickly collect feedback from their customers to better understand how they are being serviced. 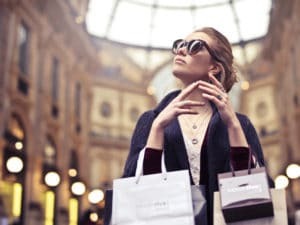 Building and distributing surveys not only helps with customer service feedback, but can also be helpful in planning upcoming sales activities and targeted marketing. In today’s blog, we’ll walk you through getting started with Voice of the Customer and setting up a survey. Voice of the Customer is available for Microsoft Dynamics 365 and Dynamics CRM Online 2016 (update and later). 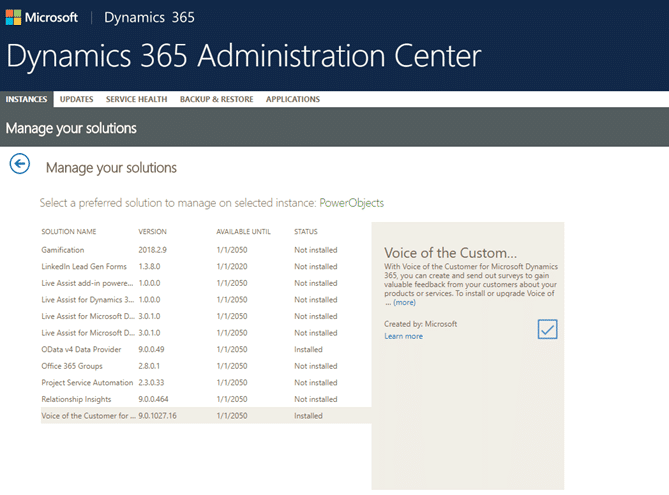 The solution can be installed from the Dynamics 365 Administration Center as shown in the image below. Now that you have Voice of the Customer installed, you can plan and build your surveys. To maximize the effectiveness, be sure you have a clear understanding of what you want to capture from the customer and how the collected data will be actionable for your organization. You will also want to make sure the surveys are short and focused. Surveys will only be effective if they are designed well and have a clear goal. For this example, we will use the default theme. Now we are ready to create a survey! Navigate to the Voice of the Customer tile and select Surveys. Create a new survey by clicking +New. This is where you can also select your theme and upload a logo from the Survey Runtime section. Survey Page Layout: The left section is used to layout your pages for the survey. Three pages are required for the welcome, questions, and completion pages. Page Editor: The middle section allows users to add survey components and edit the selected forms. Survey Parts: The right section allows users to add survey sections to the pages. You can drag and drop sections from the right section into the page editor. Now that you are finished designing the survey, you can select the Preview button from the tool bar to test the survey and verify that it is being rendered as designed. Remember to save your survey record and you are finished! Now, your survey is ready to be distributed and sent to customers.